Chinatown in Vancouver, BC, Canada is a treat for the senses. It is North America's second biggest, following San Fransisco's Chinatown. In the late 1800's, many Chinese came to Canada to work, mainly as laborers in sawmills, canneries, and coal mines. There was also a large number of Chinese that were contracted to build the Canadian Pacific Railway between 1881 and 1885. Walking around the streets of Chinatown is sheer pleasure. The excitement of open air markets with their myriad of fresh fruits and vegetables, dried herbs and spices is followed by peeking in store windows to exotic clothing and merchandise. Fresh seafood markets and warm, friendly shop merchants abound. Herbalists welcome you into the sit down counters in their shops to discuss what you need from their collection to make your life even better. Neon signs and brightly colored banners can make a dull day in Vancouver simply explode with intoxicating delight. There is a lot of history here, as well. One of the narrowest buildings in the city is located here, the Sam Key building. There are real life tales of laborers turned wealthy merchants, classical Chinese gardens built in the style of the 15th Century, and political intrigue. A truly unique and multifaceted community worth revisiting many times. I know Chinatown in San Francisco, the food was great there and very authentic! 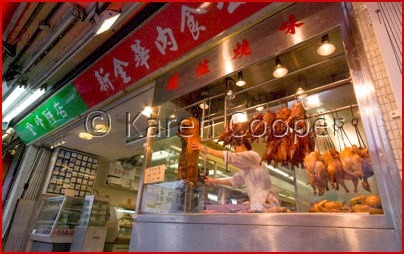 And now I know "your" Chinatown too...LOL...enjoy your food there, Karen. It looks inviting on the picture! Its an amazing place, Susanne!